TOPEKA, Kan. — The Republican governor of Kansas has signed a bill into law that protects the convictions of religious foster care and adoption agencies, in that the government is prohibited from punishing such organizations for declining to place children in certain households when doing so would violate the tenets of their faith. “The actions taken in this bill will prevent discrimination against faith-based agencies of any faith, of any creed, of any religion,” said Gov. 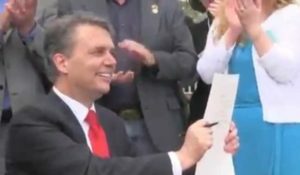 Jeff Colyer, who signed the legislation Friday at the Youth Horizons Kinloch Price Boys Ranch, a faith-based nonprofit that helps troubled youth. Homosexual advocacy groups have decried the legislation as being discriminatory, and assert that it would discourage homosexuals from pursuing adoption. Lori Ross of FosterAdopt Connect told The Wichita Eagle that while she believes religious organizations have a right to operate in accordance with their faith, she doesn’t believe that taxpayer money should be granted to agencies that “discriminate” in home placement decisions. “It is completely unfair that those same people who are going to be discouraged from fostering and adopting are going to be paying taxes into the state that are going to be used to pay agencies to do work that would discriminate against them,” she said. However, others who have commented on similar bills have noted that those involved in homosexuality do not need to approach Christian or Catholic foster and adoption agencies and try to force them to violate their beliefs when there are secular agencies available. “I believe that God could lay at the door of the Church the full responsibility for the present condition of the world. And the things over which we cluck our tongues and point our fingers and look [with] disdain down our noses about are the things which can be attributed to us, for we have not established in the earth a standard and an alternative to which a dying world might have turned,” he declared.